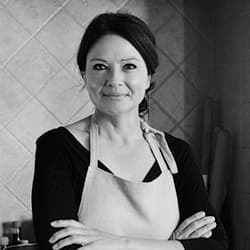 Tucked away in the quiet medieval town of Charroux lies Bagatelle, home to Marlene van der Westhuizen, chef, cookbook author and Cook’s tour host, par excelllence. Arriving at Vichy station on a warm summer’s day, our group of eight stood ready to embrace the culture, food and regional wines that make France one of the most popular food destinations in Europe. Had we known what feasting lay ahead, I think a couple of dry bread and water days would’ve helped to balance the scales. Nestled in the heart of the Boubonnais area, this charming town is considered one of the most beautiful in France. We entered the village through the arched main gate, turning into a narrow street, bottle green creepers carpeting the walls and cascading carelessly onto the street below. The ancient cobbles seemed to whisper their secrets of times past, but not forgotten. Steeped in history and a gentler way of life, Charroux offers quiet respite from the helter-skelter of a modern world. At first you wander whether the quiet is stifling, until you learn to listen within the stillness and realise that it’s this, you crave. Whether from excitement or habit, I’m up at 5am everyday. Slipping out the back door, camera in hand, I wander, solitary, through the sleeping village. The air’s still and already warm. I stop often, taking in the quaint simplicity of it all. Rugged walls are hung with baskets of colour adding cheerful frivolity to the cold, grey stone. This red planter reminded me of Schindler’s List and I imagined, that if these walls could talk, they’d tell of freedom’s price. It left me humbled and grateful. With a population of just over 400, Charroux is full of surprises. Directly opposite ‘Chez Bagatelle’ lies the mustard shop. Famed for producing some of France’s most exquisite mustards, a visit to Moutarderie de Charroux is a must. Sort after by chefs and gastronomes, the taste is unlike any other. Deeply flavoursome with a distinctive bite and a pleasant burn. We bought more than we should’ve, yet now, I could do with more. It’s that good. Besides the mustard, this is also the place to buy walnut oil. Using an old millstone, the nut oil is extracted, bottled and packed straight onto the shelves. No food miles here. When the doors open after lunch, tourists flock to get their hands on a bottle of this unique and aromatic oil. The gravelled courtyard was host to numerous alfresco meals. Somehow food eaten outdoors always tastes better, as it does too, in the company of people with spirited joy. As is the French way, market visits are a daily routine, hand-picking fresh produce, cheeses and crusty baguettes. We buy trout for supper, glossy skinned aubergines, peppers and of course, plump tomatoes that taste of the sun. There’s always bread involved and perfectly ripe fruit. Sun blushed apricots, strawberries and my favourite, pearl-skinned cranberries and currants. Strung together like nature’s pearls, currants are a must for adding luminance to our desserts. Back at Bagatelle, we crunch our way across the gravelled courtyard, depositing our market finds on the table, along with some silverware, copper basins and French linen collected en route. We muse over how lucky we are and how we plan to use these objects of virtu. Under the dappled shade of the old bay tree, icy drinks are poured and sipped in gratitude as we pass around boards with local cheese and bowls filled with salty Mediterranean olives. The pleasure of luxurious simplicity. Groaning under a plethora of fresh produce and interesting delicacies, the hard wood dining table serves as a workstation for our cook-off event. Everyone is allocated a typical French recipe to cook and present to the group. An entire day is set aside for this activity, which sounds ridiculously long but trust me, it’s hardly time enough as lengthy discussions about the dishes followed and watching the clock deemed, less important. Having cooked in the steamy pressure of professional kitchens, Marlene set up rules to ensure law and order. Needless to say, after a couple of glasses of champagne, no one gave a flying fairy about rules and the glorious mayhem that ensued was as memorable as the impeccable menu. From the sublime garlic soup that surprised us all, to the sea bass with artichokes and white wine, we were lulled into a passivity that required a nap. At 6pm we sojourned for a couple of hours in an attempt to make space for dessert. We returned to the table with renewed vigour, polishing off Apple fritters and Peach frangipane tarts with berry liqueur syrup and lashings of glorious crème fraîche. The crème fraîche in France is lusciously creamy with just the slightest hint of sour. It’s also the best I’ve ever eaten. Each night, as I turned out the light, I’d do a little chant. It went something like this….. ‘Tomorrow I will not eat crème fraîche, tomorrow I will not…..’ Needless to say, by noon the next day all resolve was tossed out the window as we continued heaping spoonfuls of this velvety cream onto baked puds and anything else that looked like a good match! Marlene’s keen eye for detail ensured that every meal was an elegant celebration. The texture of French linen napkins between your fingertips, oddly matched crockery and silky Brittany butter on rustic sourdough bread felt opulent, yet relaxed. Gathered around the table, we plunged into deep conversation and shared food that spoke of authenticity and provenance. It’s times like this that remind you of the importance of making time to share in one of humankind’s most primal practices, that of communal eating. There’s so much more to tell about this picturesque village. Part 2 of The Charroux Cook’s Tour will follow soon. In the meantime, details of future food tours to Charroux, can be found on Marlene’s website. Di so beautifully captured and love the way you included us both in this special post! Photos are also utterly magnificent! Thank you Dianne – you make even me drool with your very vivid descriptions! It was just lovely having all of you around our table at Bagatelle. It was. Charroux is all charm. Thank you my friend. I’m so thrilled that I got to share it with someone who gets as excited about rummaging around at the Brocante as me. You definitely won the scouting and linen contest! It was magical Marlene. From our arrival lunch in the courtyard to the ‘last supper’, just superb. Thank you for throwing open your doors to us. You even took a photo of me on the sly…..
You guys were a stunning group. Thank you Isabella. Charroux and the food were most photogenic. It’s not hard to see why everyone who visits this picturesque village, falls in love. You’re not an easy subject to capture with all that running around. And you were fabulous! Beautifully captured in words and photographs I can ‘almost’ taste it !! That’s so kind, Teresa. Around every corner, there was something uniquely special to capture. And yes, the food was exceptionally good! Hi please can you add me to your list. Hi Sandra. Sure, will do. Good morning Jennifer. I’ll do so with pleasure. Exquisitely charming and beautifully captured. Thank you so much, Helen. When surrounded with the charms of Charroux, it’s impossible to leave uninspired.